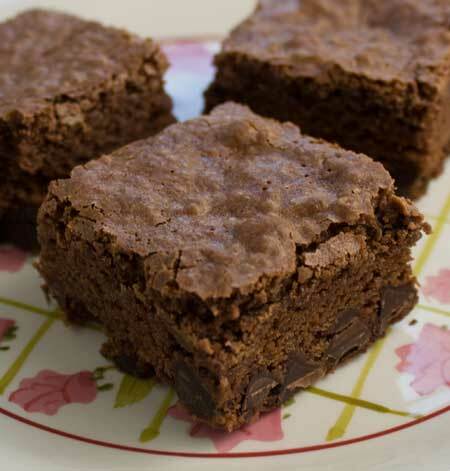 Today’s brownie recipe is adapted from a contest winner from Southern Living magazine. A $1,000 “brand winner” in the desserts category, this recipe features 1/4 cup of Millstone Coffee. Unless you brew your coffee really, really, strong, you’re not going to get much flavor from 1/4 cup brewed coffee, but in this case it doesn’t matter because the brownies are so good. If you don’t drink coffee, you could probably get away with using water. The base is made with unsweetened chocolate, but to get the full flavor and texture effect, you need to add some good chocolate chips. In the original recipe, it’s a full 2 cups, so in the half batch recipe below I used 1. Since I was making these for a group of kids, I left out the nuts. These are neither fudgy nor cakey but rather somewhere in between. They bake at fairly high temperature, so keep an eye on them and err on the side of underbaking rather than over. Mine were perfect in 30 minutes, but the full batch will need 35. Here’s a link to the 9×13 inch version of Deluxe Brownies. Below is the 8 inch version. Beat eggs on high speed of an electric mixer. Gradually add sugar and vanilla, beating 3 minutes or until thick and pale. Add chocolate mixture to egg mixture, beating until blended. Gradually add flour, stirring just until blended. Stir in chocolate morsels and walnuts (if using). Pour into the pan and bake on center rack at at 375° for 30 minutes. Cool in pan on a wire rack for about an hour, then transfer to refrigerator and chill for another hour or two or until very cold. Lift foil with brownies out of pan. Cut brownies into squares. Hi Jenny, I wouldn’t try that. A better substitute would be to use unsweetened cocoa powder and butter. For ever ounce of unsweetened chocolate (in this case, two), use 3 tablespoons of cocoa powder and 1 tablespoon of butter. So for the 2 ounces of chocolate, use 6 tablespoons of cocoa powder (a little over 1/3 cup or 1 ounce in weight) and 2 tablespoons of butter. hi, i was just wondering if i could use dark chocolate chips instead of unsweetened chocolate but use less sugar. it’s hard to find unsweetened chocolate where i live. Awesome! That made my day! I think it’s neat that she’s 13 and discriminating. Kids are excellent tasters when they know that you really want an honest opinion and that you are truly taking things into account. They should do a Top Chef kids, with kids taking over for Padma, Tom and Gail. My niece says they are the best brownies I’ve made so far!!! Just thought you should know. She is 13 and a dark-chocoholic, but she is still discriminating. She gives her honest opinions. Thanks for the detailed review! That’s terrific that you were able to use 2 ounces of dark chocolate in place of unsweetened. Your version is definitely more convenient since you don’t have to bother with buying unsweetened chocolate. That being said, now you just have to try them with the unsweetened chocolate! By the way, there’s a recipe on allrecipes.com called Mmm Brownies which might also be convenient for those days when there isn’t any unsweetened chocolate in the house. I have yet to try it, but it has great reviews. Hi All, I made the brownies. With a couple of modifications. I added 1/2 tsp. chocolate extract. I figured if there was 1/2 tsp. vanilla, equal amt of choc. would work. Instead of the chocolate squares I used 1/3 c. of special dark choc. chips = 2 oz. I weighed on my older than dirt WW scale. My brain wasn’t thinking right then… I did have the choc. squares in the cupboard but the choc. chip bag was sitting out already… No coffee, just used water. Plus then I used the same dk. choc. chips in the batter. They baked up lovely, although even after an extra 4 minutes baking time were still very gooey. But I like my brownies under done. These were definately under baked. The taste was wonderful. I couldn’t wait for them to chill. Wow! Loved the intense chocolate flavor. And this morning after chilling, well, I like them warmed back to room temp. better. Very reminiscent for texture of my mom’s brownie recipe that she got from a great aunt before I was born. No choc. chips in that one though. I might try Mom’s recipe with the choc. extract. Karen, in my experience, things made with melted butter have a denser texture. These brownies are interesting because they’re light (like cake), but dense. They don’t appear to be very special at first glance, but they taste rich. They remind me of a local Austin brownie called Mrs. Butter’s Brownies. About the chocolate extract, I thought about adding some then decided not to. It might have added extra flavor, but the brownies didn’t necessarily *need* it. And if I did use chocolate extract, I’d only use 1/2 to 3/4 teaspoons and still use the 2 tablespoons of coffee (even if I didn’t like it) or 2 tablespoons of water (if I didn’t use coffee because I didn’t have it or for other reasons). Katrina, I’m so happy to hear you tried the Viceroy granola. Post a link to your review if you get a chance. Oh, and back to the coffee. The reason I said it doesn’t add much flavor is because I think two tablespoons of coffee divided among a whole pan of brownies just wouldn’t do much, so even coffee haters probably wouldn’t notice the flavor. For more coffee flavor or for just enough coffee to intensify the chocolate (as Adam mentioned), I’d add a little instant coffee to the batter or dissolve an instant coffee packet in water. Made the granola. Now I want brownies! Karen, I did make brownies with chocolate extract in them back when Anna was first talking about extracts. It was a brownie recipe right on the extract box (Watkins). I liked it! And while reading about this and knowing I don’t use coffee either, I actually thought of that extract–though I wouldn’t use it per tablespoon in place of the coffee, I’d go with less, maybe a teaspoon and the rest water. Another thought–Anna, are you still using your chocolate extract in your baking? I haven’t tried it with something like brownies, although it really enhances the hot chocolate when I add to the heated mixture. I was just thinking about what the extract might do to this recipe, maybe since I don’t like coffee flavor at all, adding the chocolate extract would be pretty darn tasty. I am curious about the science of melting the butter rather than just having it softened. I recently noticed that in your post of Lee’s Chocolate Chip cookies also. The Hershey Special Dark choc. chips were just on sale for a buck less per package. I should have picked up a “CASE” full. LOL. Always on the hunt for another perfect brownie! And I, too, subscribe to “the more chocolate chips the better” philosophy Thanks for the recipe. I used salted butter, decaffeinated coffee, and added 2 T of extra flour. They were still great!!! Thanks for the recipe!! I think I will give these a try, I am allergic to grains so will switch the flour out with either almond flour or quinoa . . .
See my post about this post! They are wonderful!!!! Gloria, the batter is supposed to be thin. Hopefully the extra 2 tablespoons of flour won’t have a negative effect. Let me know what happens. But yes, the batter is almost like cake batter. They are in the oven now!! Followed the recipe with only ONE exception. The batter was thinner than I’m used to so I added 2 T more flour. The raw batter is DELICIOUS!!!!! I’ll update again later when they are out and cooled a little. Mary, I highly recommend these brownies. If you’re on a brownie kick, give them a try. Gloria, I always used Guittard extra dark. My grocery store sells them! Lisa, I actually halved the whole recipe and not just the chips. Maybe I should reword that, because in this case the more chips the better. Wow! Those look quite perfect! And the chocolate chips in the chocolate bottom…yum! I just made Nigella’s chocolate chocolate chip muffins, subbing out a half a cup of milk with coffee. Coffee and chocolate always attract me as a great baking combination…and coffee is particularly nice because it’s very flavorful without having to add extra sugar or fat.